First of all - I was SO happy today because Harper had a great day in the nursery!! You have no idea how hard I have prayed today and it was so nice to go check on her twice and neither time was she crying or screaming. I'm so thankful for her sweet nursery workers who love on her! My parents were here today and got to go to church with us and see her in the nursery! And we went to lunch and she was so happy and did so good. OH it was just a great day! My dad got home from India last night and we were so glad to have him home safe and sound. Tomorrow is his birthday and today is Grandparents day so we were glad to spend time with them! 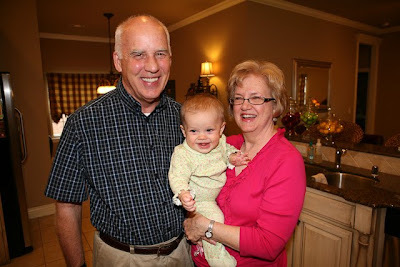 Harper is so blessed to have four wonderful grandparents in her life! We were playing with her in her room and she started pulling up on me!!! She is just changing and growing so quickly these days! I told ya'll yesterday about my "faith" dress and then I found out something SO amazing about it and I just have to share because I want to show you how God is at work even when you don't know it and feel like your prayers are not being answered. But first I feel like I should share that YES - I love having a girl but I used to DREAM of having three boys. I would have been over the moon if we had had a boy. I don't want anyone to think I would have been unhappy with a boy. I dreamed of a boy playing football and I still secretly wish for a boy if we have another child. There is nothing sweeter than a little boy. It's just that I just always had this feeling I would have a daughter. I can't explain it but I just knew. Anyway..........I think this is unbelievable. When I shared the story of the dress yesterday - the lady who I bought it from off of etsy left me a comment and then she e-mailed me to share something with me and it just gave me chills and made me cry. She has been reading my blog since Harper was born but had no idea she had one time made a dress for her until she saw it yesterday. And she remembered it because when she made it - she felt like God asked her to pray over the dress and to pray for the little girl who would be wearing it. She had no idea that at the the time there WAS no little girl yet or that the little girl would really need prayers at one point. See how God goes ahead and works in such amazing ways??? HE LOVES US - OH HOW HE LOVES US! And finally - look who is starting to crawl!!!! When did she get so big??? So this is my 1000th post!!! WOW - that is a whole lot of rambling from me. So in honor of my 1000th post - I was wondering if you read my blog - I would love to hear from ALL of you - even the lurkers who have never commented - and I would love to hear one thing you are thankful for today! It would be great to start off this week with a LONG list of uplifting praises and I would love to hear from EVERYONE who is reading!!! Ya'll hear from me every day - now I'd like to hear from you!!!! Checking in from Georgia and today I am so thankful for my family. After years of infertility, I was blessed with triplets and look at them everyday in amazement. Have a great week! I'm thankful for your blog and the prayer blog! They have been such a blessing, and I love having other people to pray for who are going through infertility. I'm thankful that I am finally pregnant, and I'm so thankful for my husband. And finally, I'm so thankful for the body of Christ, and the way God uses it so creatively to lift up and help other believers! I am thankful for my precious son, who turns 18 months old this month, for his continued good health and the way he lights up my life each and every day! I love reading your blog. It's so uplifting and REAL. Thanks for sharing your life with all of us. I am thankful to be a mom to three really wonderful kids, when at one time I didn't think I could ever have any. Have a great week! Yes, it is my first time to sign in. I have read your blog since Harper was born. You inspired me to start a blog. I am pregnant with twins and wanted a way to document our growing family. I love reading about you and your sweet family. God bless you. Hi Kelly! I'm thankful for God's grace and love. I'm also thankful for my 3 children and husband, they are my heart and I constantly thank the Lord for them! i've been reading your blog for some time now but have never commented...until now :). i'm thankful for a super sweet, amazing, godly husband the Lord blessed me with. we've been married for 9 mos (i had just turned 30) and he is such a gift to me. i honestly had begun to give up hope that i would ever get married so i am so thankful for this incredible gift from the Lord :). btw--harper is gorgeous and absolutely precious. Hi Kelly! I don't think I've ever commented on your blog but I read it all the time! You are so honest and have such faith, it is refreshing. Today I am so thankful for the beautiful weather we had and the opportunity to spend some quality time with my family. We had a great day outside and there was nothing more I could've asked for! I'm out there reading about Harper and your family every week! She is a doll and you are so faithful your blog is contagious! I am thankful for my health (cancer free at this time), my beautiful family and a grand baby on the way! I am so thankful for my new Bible study I started a couple weeks ago. I am doing Experiencing God and I am already learning and experiencing so much and my Bible study group is incredible. Wow, Kelly! That is INCREDIBLE! I'm thankful for a God who shows me every single day that He is 100% completely involved--and cares about!--the little details in our lives! I am thankful for my husband, my two sweet baby girls, and getting to spend the weekend with my in-laws who inspire me with their strong faith in God. I know everyday that I am prayed over by them and that is such a comfort. Thank you for your blog and sharing your life! I am thankful for our son who we conceived after almost 3 years of trying. I am grateful for the knowledge of the physicians and the greatest physician for allowing us to get pregnant. I am thankful for now being almost 23 pregnant with our little girl. This baby is divine intervention. I am thankful for my husband and parents. I am thankful for my faith! I'm thankful for my wonderful family and my friends. Hi Kelly! I've been reading your blog since Harper was born. Became a quick fan of yours and have subscribed to you since. I live in Cincinnati, so it was fun to see that you guys traveled there a few weeks ago! I'm thankful for my husband and the life we share together. I am thankful for my daughter....a true miracle. She was born 15 weeks early weighing 1lb 15oz. She got VERY sick after 3 weeks and was placed on life support. We were told twice she was not going to make it! She and God had different plans!! Miracles happen....I have proof! I'm thankful for my family--four precious kids and a fantastic husband. Blessed beyond measure. Have a wonderful week! Hey Kelly, I read your blog all the time. My daughter is about the same age as Harper and I just love watching her grow.Today I was thanking God for giving us a healthy baby girl because after reading other blogs today I realize how many other families are dealing with so much pain. Thank you for your inspiring blog. I've been reading your blog since right before Harper was born. I've commented a few times, but to be honest, I never comment because I feel like you already have so many to read. I am thankful for so much. It has been the best weekend, and that always makes it super easy. I am thankful to serve a God of second chances, a God whom I can call on whenever and where ever. I am also thankful for my ever so sweet and patient husband. I'm a lucky girl!! I read everyday, but don't always comment. Thank you for your faith and your transparency in how God has worked in you. I am a single young woman still seeking God's will for my life, and reading about how he blessed you in his timing is a constant reassurance of his love for me and his plan for my life! Just recently started reading your blog. It is so encouraging and inspiring. I am thankful for my family. The next few weeks will be hard due to us being further apart, but I'm thankful for the time we have had living so close to each other. I am thankful that my sisters moved closer to me this summer. We are all hanging out at their house, and it's so WONDERFUL! I am thankful that there are bloggers who spread the love of Christ in a big way and who have such a positive outview like you do. I am also so thankful to have a little girl to dress up. She is 10 1/2 month and the joy of my life! I am thankful for a job that I truly love...teaching! and a family I love even more. I am thankful for a loving and Godly husband. I'm also thankful for two healthy boys. We're also all thankful for our newest family member...our first niece who happens to be named Harper. She was born at 31.3 weeks, so she's got a long stay in the NICU. But praise God she's making progress. We cannot wait to welcome her home and meet her. I am thankful for my three beautiful children and the child God is growing in our hearts that we are adopting from Ethiopia. God's ways are amazing and He is to be praised for every aspect of our lives. He deserves all of the glory and I am so happy to see and read your posts where you sing His praises and the thanks you constantly give Him for your beautiful Harper. I am thankful that God will not fulfill his destiny without me and his promises are good! I am most thankful for my two healthy beautiful loving children. Twenty-three and twenty-five years old!!! I read your blog everyday religiously from NC! I am thankful for an amazing fiance, a wonderful family, and the best friends ever! I am also very blessed for the life I live! Hi Kelly--I just want to let you know you inspired me to start my blog and I am lovin' it and thankful for you and your wonderful spirit! I am especially thankful for my wonderful family--I love my husband and kids so much! God has blessed us! I am so thankful that I have my husband and my son. My husband loves me and takes care of me the way every woman deserves to loved and taken care of and my son just melts my heart with every look and smile. I'm thankful that GOD takes care of us and always catches us when we fall. I am thankful for your prayer blog! I was one of the first of so many that was on the Waiting for a Baby list. I told you that we're pregnant with twins and now we're expecting their arrival any time this week or next. Prayer is so powerful. We're excited to have 2 little boys that are going to rock our world! Hi Kelly! I love reading your blog and watching Harper grow! I am thankful for my sweet husband and our Hudson on the way. I am thankful that I feel him kick in my belly lots, it is such a wonderful reassurance! I pray that all of those wanting a baby and praying for one too because I am so blessed and want others to know how wonderful pregnancy is (and motherhood too, even though I'm not there yet)! Hope you have a blessed Sunday! Hey Kelly! Congratulations to Harper on the crawling! What a big girl! :o) I'm so thankful for my sweet baby girl who just turned ONE yesterday! Where does the time go?? I've been a lurker for a while now, I guess I'm coming out! I really enjoy reading about your life, Kelly. I always wonder, is she really that sweet? I am so thankful for my little miracle heart baby, Milo. Born May 1, home from the hospital July 14 and thriving well. Now that is something I thank God for every day! Love this dress story!!! you are so precious....I'm so thankful for my 3 precious children that I prayed for long before they came...and especially for his Grace on us when we didn't think we could have them! this is why our 3rd. child, a daughter's name is ....Grace! Today, I am thankful that after sharing 1 car with my husband for the last 6 weeks we were able to purchase a new car to us yesterday! It was a huge answer to prayer! I love reading about Harper I've been since the beginning of Harpers story. She is so cute and I know you know your blessed to have her and Scott in your life. I am thankful to have a wonderful, caring and providing husband. I started reading your blog when I found out about Harper's being sick the same way that Blair was. I've enjoyed your posts and experiences since then! Today I'm thankful for my family -- that we are healthy and safe! Congrats on the 1000th post! I am so thankful for my kiddos- the oldest of which turned 13 today- so much fun, and so hard at the same time. I am so thankful that my son has five grandparents and three great grandparents to celebrate with today for grandparent's day! Don't quite remember how I found your blog a long time ago...but loved the fact that you are a fellow Arkansan and Hog fan. I am so thankful for my MOPS group which starts back up for this school year tomorrow! I am thankful to be home with my husband for a precious two weeks before I go back on tour...And what an amazing story that little dress and your sweet daughter is!!! I ma thankful that He does love us~ oh, how He loves us!! We actually sang that song in church today and I started tearing up just picturing our GREAT GOD loving me so well. I am also thankful for my family and God's blessings on our life. I don't remember how I came across your blog when Harper was born but I did. I am thankful today for the GOD we have and how HE has blessed my life with the love of an awsome family. He brought us through my son's bone cancer, he brought us though my moms breast cancer, and all of the other things in life when I needed someone beside me. I pray every time I read someone new on your blog. Thanks for sharing! I am thankful my husband is beside me color coding my handbell notes. I love playing in our choir, but I can't read music. So he is marking the notes for me with a specific color so I know what to play. YAY! I'm thankful for a wonderful husband who knows my love language... acts of service! He helped cleaned the whole house and all of the laundry so we could spend time together this evening. The dress story gave me chills by the way! Thankful today for my husband, three kiddos, and baby #4 on the way! Hey Kelly! Pretty sure it has been over a year that I have been reading your blog and never commented! Just an Edmond, OK girl reading about someone I don't know in Arkansas, and loving every post! I have a 6 month old daughter and love reading about your daughter! Addie is just a few steps behind! Kelly, I read every post here in Houston. I was so proud of you for telling the world about okra! LOL Who knew? :) I am so thankful today for my grandparents! Absolute blessings in my life! They are amazing great grandparents as well and we were blessed today to spend it with them at church and lunch afterwards! I bought a pink blanket for a friend but kept it in hopes for my own girl... it is now my daughters favorite blanket and it is a good reminder to me of all the gifts God has given me! Harper is a doll and I love keeping up with you both! I'm a lurker, coming out of lurkdom! :) I recently became a mother of a little girl, Lyla and I am especially thankful for her today as we found out yesterday that a close friend, a 16-year-old boy, was killed in an automobile accident. So today I'm thankful for Lyla, my husband, my family, and friends. I am sooo thankful for my 3 boys! I plan on having a sweet granddaughter some day though so I can buy those precious clothes and bows! That is such an amazing story, Kelly! I am thankful for your blog, because I met Veronica through it and she has quickly become my very best friend, even though I live in TX and she lives in CA and we've never even met (yet!). It is a friendship that could've only been orchestrated by God and I am thankful for it every day!! I am thankful for my little boy who is almost 2 and a blessing! Reading from Mississippi, and I am thankful for three healthy and beautiful daughters, a devoted husband, the opportunity I have to stay home with our kids, the excellent school our oldest daughter attends, and my loving parents. I'm thankful that I got to spend my 28th birthday today with the love of my life and our beautiful daughter. It was a great birthday! Oh, one more thing....I'm thankful I was a winner of your Selah CD giveaway! I have listened to it over and over and over again. My favorite song is "You Deliver Me." I am thankful for my amazing church family! Just spent a full day with them, and even though I'm exhausted, I loved every minute of it. I can only hope that's what heaven will be like! I've been reading your blog since my friend Annalee posted about Harper back when she was born. I've been hooked ever since, and I love your story! Like so many others, I'm beyond thankful for my kids. Sure, they try my patience at times (I have a 6 year old boy, and 4 year old boy, a 1 year old girl), but they also fill my life with such joy. So thankful for my sweet hubby and precious little girl!!! I am so thankful that you are not afraid to blog about your faith. It is so refreshing! Keep it up! I've only commented a handful of times, but I'm a faithful reader! Today I'm thankful for my three wild little ones and their daddy who coaxed teary-eyed laughter from them at dinner. I am so thankful that I am finally starting to understand how much Our Lord loves me. I am thankful that I can trust him more and more everyday. Your blog has certainly helped with that , so I am also thankful for finding you. Congrats on the 1000th post, can't wait for the next 1000!!!! Oh goodness, where do I start?! I am thankful for our wonderful GOD, my loving husband, our families, our jobs, my Bichon (Lily), the fall weather, chocolate.... :-) I could go on and on! Thank you again for sharing your life with so many people! Wow, 1000 posts, CONGRATS! I am SO thankful to be an American, for a loving family and for an amazing job that I love. I started reading your blog the day Harper was born! I came here from another blog when you were still in labor, and kept checking in on your progress. I cried when I read how sick Harper was, and my husband and I prayed for her. I have been reading your blog ever since and love seeing how Harper is growing. She is beautiful! I am thankful for my two beautiful healthy children and for a husband who will pray with and for me and who loves me when I am oh so unloveable! 1000 posts?! Oh my goodness! I'm thankful for my healthy twin girls who just turned ONE! They were born at 30 weeks and stayed in the NICU for a couple months, but God healed them- they are happy healthy beautiful baby girls. For that I am blessed and beyond thankful! I am thankful for my healthy and happy little girl. I am thankful for our new home and our new church. I am thankful for good friends and wonderful family. I am thankful for a God who's mercies are new each morning! Kelly, I'm thankful for you and the way you share your heart so openly and honestly. God has used you so, so many times to encourage me! I'm thankful for wonderful family and friends that God loves me through. I'm thankful for a job I enjoy where I can hopefully make a difference in the lives of kids by sharing God's love. I'm thankful for salvation, God's faithfulness, unconditional love, and the way He's in control of the plans for my life. Hello Kelly, I havent left you a comment for ages as I always think you have to be so overwhelmed with how many comments you have to work through!! I am thankful for the rain after the drought that Texas has been under and the fact that it was cool enough to get out my jeans and they weren't too tight on my thighs (which was my biggest fear!). And of course thankful for my beautiful children who keep me smiling! I am thankful for an amazing husband and healthy daughter that is growing and changing everyday. I am thankful that we got to sit outside tonight and watch her play for an hour and enjoy her laugh-what a blessing. I have enjoyed reading about Harper-have commented a few times and will continue to check on you!!! I'm thankful that my Grandma who passed away this morning is in Heaven. She spent her whole life serving the Lord as a missionary to Africa and then got cirrhosis of the liver due to a malaria medication. She is healed, whole, and singing at the feet of Jesus tonight. I'm also so thankful for my wonderful husband and sweet children. I am thankful for a loving family. I am so very thankful for my beautiful baby girl (almost 18 months now!) and my wonderful husband. I am blessed to have such a lovely family that make me laugh and love me as much as I love them. I am thankful for my extended family as well, I grew up with wonderful parents and brothers and with the addition of my husband's family there's a whole lot of family around now. I am also thankful that I love my job (I am a teacher) even though I work so hard at it, it's easier to do and easier to be away from my little one because I love it. I love your blog! I check it everyday to see what is happening in Harper-Land! I am thankful for my daughter, Payton. Her brother went to be with Jesus when he was just 5 days old, and we have missed him terribly the past two years. Payton is our little blessing and I can't believe she is already 7 weeks old! My how they grow! Thankful for this blog and a place to come and feel understood. I am going through the battle of infertility. Even though my heart aches to be a mother I am thankful for the life I live. I am lucky to have a house, a job, a loving husband and a God who forgives me daily. Kelly, I absolutely LOVE LOVE LOVE your blog! I don't comment very much, but I thought in honor of your 1000th post, I just couldn't resist! I love reading about all the blessings in your life and how you use them to praise the Lord. He is SO faithful!!! One of my biggest blessings is my marriage. I love my husband so much, and I am grateful the Lord has blessed me with such an incredibly best friend. I'm an Arkansas girl who is now living in New Jersey. After 2-1/2 years of infertility, I am so thankful for my almost 2-year old son, Jackson. He is such a joy! I am doubly thankful for the little life that is growing inside of me and due in only four weeks...the Lord is so good! Thank you for sharing the story about the lady who made Harper's dress. That was very encouraging to read! What a cool story about the dress! 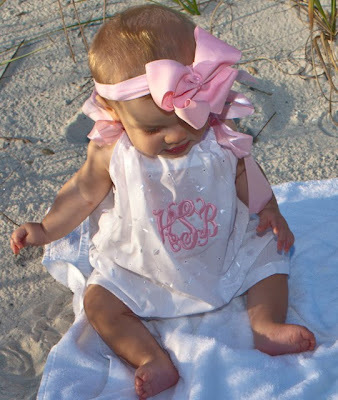 I too, bought a "faith" dress for Kyleigh before she was born! I was only 8 weeks along and had no idea that she would even BE a girl but I just knew. Holding onto that dress helped me through so many scary nights in the pregnancy! I am thankful to be alive. I am also thankful that I can worship in a country where I am not persecuted for doing so :). Today and every day I am thankful for my wonderful husband, for all he does for me and for giving me a beautiful daughter. I have never commented on your blog before. I live in Sac, CA and have a 4 month old that I am sooooooo thankful for since he is my miracle IVF boy. Harper and Landon would make a cute couple when they were older LOL She is just a doll. I have read your blog since your pregnancy and I have never commented. But, I read your blog everyday because it is uplifting and positive. I prayed for Harper while she was in the hospital, bcs we lost our little girl Hayden Grace almost 3years ago to a terminal heart condition. We hope to adopt soon and I am thankful for such supportive and amazing family and friends. I love your blog Kelly!! I am thankful for God's unconditional love and His forgiveness. I'm reading from Chattanooga, TN. Tonight I am thankful for my wonderful family. My husband was out of town last week, came home for the weekend, and has to go out of town again for four days. We have two sons, and I am pregnant with baby #3. He is such a huge help to me, so when he's gone (which isn't that much--he's just training for a new job), I really, really miss him!!! I am also very thankful for such a wonderful church with a special needs ministry so that my younger son Benjamin, who has Down syndrome, can be in a special nursery room and have wonderful care. We even have a class for moms of special needs children, and the time we have together each week is just so blessed. I have been a lurker since Harper was born! I have a baby girl who is 14 months now so I was glued to your blog, praying and crying. I remember the first time you got to hold her--called my husband into the room and had him read your post! Congrats on 1000 posts and more importantly, congrats on your sweet baby girl. Lurker from FL (Go Gators!) leaving a comment to let you know I'm reading and love your blog! My name is Brooke and I am from Illinois. I've been reading your blog since Harper was born. Today I am thankful for my 4 kids...12 yrs., 11 yrs., almost 3, & 4 mo. I think I have left a coment a couple of times but I really enjoy reading your blog. I think it is because we have a lot in common. My dad is also a baptist minister, I have 3 little ones 5 and under(a boy and 2 girls who always wear BIG BOWS!) I love fashion (especially ruffles and Cheap FOREVER 21 accesories!) I love food , friends and taking pictures of all three of my babies. You are a wonderful witness in the Blog world and I have no doubt that God uses you every day. Keep enjoying that precious baby of yours! They grow way to fast!!! More than anything, I'm thankful for my salvation. Second to that, I'm thankful for the health and love of a fabulous family. PS- I dream of having three boys, too! I am thankful for my little girl that we prayed for for 10 years. She's such a blessing in our life. I enjoy reading your blog because you and I both seem to be so similar in our awe of what God has blessed us with. Keep blogging. God bless. Hi Kelly - I am reading from Baytown, TX and have been following your blog since before you were even pregnant. Now that's a long time! You are such an inspiration to me. I am thankful for my 93 year old grandmother who loves the Lord and has taught me about Jesus and is a role model of a Christian. She still goes to church every Sunday! thank you for your sweet blog!! i'm thankful for a sweet husband that is so incredible to me & for God giving us another day without sickness!! Long time reader but have never left a comment. Congrats on 1000 posts! You are such an inspiration to moms and you are ministering to them as well. I am thankful for so many things, but today I am thankful for my sweet husband and two healthy sons. BTW...I too have always thought I would have 3 boys. I'm on my way, I guess! That video of Harper crawling is adorable!!! Today I'm thankful for my wonderful family and all the moments that we get to spend together. Hi Kelly! Audra from Mississippi here. I'm so thankful that God doesn't always follow our plan. ;) That he listens to our desires, but gives us what is best. I had my life planned out to a "T" years ago, and I think he laughed and tossed it into the trash! LOL My life is very different than what I expected, but it's PERFECT. I stay home with my little boy and have learned to be more frugal and He has drawn me so close to Him! What an unexpected blessing!! I am thankful for my beautiful nieces! They mean the world to me and I thank God so much for them! I too am thankful for my husband. He was gone the last 2 weeks for work and I missed him terribly. Having 3 active kids, I totally need his help here at home. I am also thankful for his job that is great, but don't like it when he travels! I was just telling my husband that I am about to have my 100th post! I couldn't imagine having a 1000! Congrats! Anyway, I am thankful for my family...always! I'm just a blog lurker but I looove yours! I'm still in high school, and you give me so much hope about my future, and your faith inspires me so much. I am thankful for the love that God shows me in so many different ways. Writing from Las Vegas...although I am an Alabama girl at heart. Go SEC. I love your blog. I started reading when Harper was in the hospital and have been addicted ever since. It's amazing to hear your Southern voice on the videos...it makes me think of home. I am newly pregnant and taking notes from you!!! I am thankful for my wonderful husband, my adorable son who will be celebrating his first birthday this coming Sunday, for my family that loves me regardless of my quirks, and, most importantly, I am thankful for my Savior how has given me all these blessings. I have never commented on your blog before. I have thought about it several times but someone else recommended whatever I was going to say (i.e. wear sleepsacks, put diapers on backwards, etc.) so I always shy-ed away. Congrats on reaching 1000 posts. I love reading your blog. I am thankful for God's constant provision for us. My husband and I have stepped out in faith in a career change and me going back to school and trust me, it was not the logical thing for us, but He has provided all that we need and we trust that He will continue to do so. SO I'm thankful this week for all those babies and moms that are coming this week to the hospital and all the love and joy I get to experience by praying for them. I know that there will be hard cases too, but in that hard times God is the only this that can be bigger than that pain and hurt! I am thankful for the little girl in my arms and the other 3 children sleeping upstairs. and for my husband who works so hard to take care of us all! Happy 1,000 post blogiversary! I and from Pennsylvania and don't recall how I found your blog but love reading your down to earth stories as well as seeing the pictures! Thanks for sharing snippets of your life with us! I am extremely thankful for my husband. It's not always easy for me to show my feelings to him, but I want him to know that no matter what, I love him with all of my heart. He came into my life 4 years ago, and has gone through life with me so far without judging and always showing his support. He was surely sent from a higher place. I am also extremely grateful to God that he allowed my now husband to have met my father and had dinner with us at our last family dinner before he passed. I know my Dad would have approved of our marriage, and was there with us in spirit on my wedding day. I am extremely grateful for that. I get through my dad's passing with my family, my husband, and my faith. Love reading your blog. It is so uplifting and positive. Thank you for sharing a little bit of your life with us all. I am thankful for my family first and foremost, our health, a job I love and that I am fortunate enough to work with my sister. I am also thankful for God's grace! I am a reader from Tulsa, OK. I have been following your blog since Harper was born. I used to say special prayers for her because my niece was on ECMO at St. Francis and when you wrote about it on your blog I knew what you were going through and I also have a little girl right about Harper's age so I love reading about all her milestones because I am right there with you. I am so thankful today for my 2 healthy children for God's never ending love! Have a blessed week! Happy 100th post! I always read your blog and get so much encouragement to wait patiently for the man I'm meant to be with. Your blog is such a blessing! And of course I love all the pictures of sweet Harper. Thank you for being you, Kelly! Hello from Indiana. I have never commented before, but felt I should after reading this post. = ) I check in daily, and enjoying reading about your family. Hi! Congrats on your 1000th post :) Today, I'm thankful for God's grace... in spite of my imperfections, He still loves me and covers my flaws and voids completely. Amen! Kelly- We are past due on a play date!!!! =) I miss you! Okay, I had chills when I read that about the lady who made her dress, I teared up too! GOD IS GOOD!!!!! So exciting to see Harper pull up! I can't wait to give her big kisses! I am one of those lurkers-have followed your blog for a long time now. I myself struggled for years before becoming pregnant with my son Brayden. I was told that my health would never withstand the pregnancy and that we should abort. I knew God had better plans, and I ended up having a very healthy pregnancy, and new baby boy. I am grateful to God everyday for that-I have been truly blessed. Harper is precious by the way, and I have prayed so many times for your beautiful family. I will leave comments more often-I promise :-) God Bless. I am thankful that my husband and I have two healthy boys. Yay Harper! She is a doll! It goes by sooo fast. I love reading your blog, you are very uplifting. I am so thankful for my family and 3 healthy children. im thankful for my family - they are my greatest blessing. I'm thankful that I received my very first birthday card from my grand daughter on grand parents day! By the way, have I told you that my grand baby is the most precious baby in all of the world? I am thankful for my amazing son. We just lost a baby while I was in my 14th week and it has made me appreciate and love on my son so much more. I've been reading your blog since Harper was born and just wanted to tell you that God has used you to bless me and my group of friends so much. We are all single girls in our twenties who want so badly to be married and have a family. Your words of encouragement and hope for those of us who are waiting mean so much! Today I am so thankful for my amazing group of friends. I prayed so long and so hard for a group of single girls I could share my heart with and the Lord has blessed me beyond what I could possibly imagine. Keep blogging and blessing all of us with your uplifting words! Today I am thankful for all the wonderful friends and family in my life. God has blessed me with some great people in my life! And I'm thankful that God always provides for me even when I question how or when! I have been following your blog for the past few months and it has been a true blessing! Harper is such a cutie and a wonderful gift from God. I am thankful for my husband of 6 years( we just celebrated our anniversary) and also my 3 yr. old little boy. I am so blessed by the wonderful family God has give me. Thank you for sharing your heart and your family with others. I look forward to reading about all the Lord continues to do in your life! First off, I love reading your blog everyday! It is so uplifting and you always seem to say the things that I need to hear :) Now for what I am thankful for...there is so much that God has blessed me with! I am thankful for my wonderful husband who is so perfect for me in every way! It is an honor to be his wife! I am also thankful for our sweet baby boy, Carson. He is only a few weeks younger than Harper. He was born 2 months early and had to spend 2 weeks in the NICU, so I too know the pain of having to go home without your baby. But he is almost 8 months old now and doing wonderfully! I am so thankful that God chose me to be his mommy! There is no greater blessing than a child! I've commented before - I'm down in the road in the River Valley! And today I am thankful my almost one year old girl is feeling better after being sick the last 3 days with an ear infection. So rough seeing your baby hurting and in pain! Glad she is healing! Hi! I'm a lurker, I normally don't post comments, but here I am! I'm so very thankful for my 2 healthy and happy children. My brother just returned from Iraq and I am so thankful he made it home safe and sound. It's Lee Ann from East Texas! Today I'm thankful for my loving and supportive family and friends. I'm also thankful that the Lord has given you a heart for us single girls and your blog that is such a testimony of how faithful the Lord is when we trust him. Oh, Kelly girl...that story just makes my heart soar in praise of our God who loves us so much we cannot possibly even come close to imagining. That is just too cool about the dress. WOW! I am thankful for Jesus...my sweet Connor-boo, a wonderful husband, and my precious "faith baby" girl...getting to stay home with my kids...terrific friends and family...and did I mention Jesus? Oh, how He loves us indeed!!! I shudder to think where I would be without Him! Thanks for the 1000 posts. I have read all of them-when I "found" you I went back through the archives!- and each one is precious! Have a great week! Kelly, I am so thankful to be a mom and so thankful for my little boys birth parents who were so unselfish in their love for him. God is so good all the time! I'm thankful that I became the mother of 3 great kids - one is my biological dtr and the other 2 are my hsbs from a previous - I had the priviledge of raising them as well.I always wanted 3 kids, so it was perfect! I had 5 years of infertility treatments, a miscarrage and during my pregnancy I had a complete placenta previa and almost lost my dtr a few times. She was born 6 weeks early and lived in NICU for 3 weeks- but now she is 18! Thankful doesn't even begin to express my feelings. I am so thankful that the Lord has revealed himself to me lately! His timing is impeccable and I love living my life knowing that I have complete trust in Him! I am SO thankful for my healthy family. After your Tweet yesterday, I read your prayer blog, and have spent pretty much every minute since then thanking God for my health, my husband's health, the health of my two girls, and the health of my precious (very, very prayed for!) baby in my tummy!! First and for most I am Thankful for what I have! It may not be much to others but to me it is EVERYTHING to me!! That includes my husband, my 2 daughters, my parents, my brother and my home! I am thankful that after my husband being laid off for over 5 months he went back to work last Thursday and on the same day I was offered a job that I had applied for over the summer. I now work with Special Ed. children and I LOVE IT!! I am also SO thankful today that 2 of our friends are doing well. On Thursday my daughters 11 year old friend (Jordan) fell at school and was unconcious and started having seizures. And then on Friday a friend of my ours was in a motorcycle accident. He is going in for surgery in the morning but all in all is doing well!! So to say the least I have LOTS of things be Thankful for today!! Congrats on 1000! You have had me hooked over a year now! Reading your blog from College Station, Texas and just LOVE it! Happy 1000th post! Today I am thankful for my family and my health! I have been reading your blog since Harper was born and you have sooo many comments I just read and leave! But you wanted to hear from all of us so here I am!! I am so thankful for all of God's many blessings!! I have been way to bless to focus on just one thing!! I hope God continues to Bless you and your family!! Your Blog is such a blessing to me! Have a great day and Maybe go check out my blog and send me some blogging suggestions...I am still new at this!! ooo, I am thankful for my husband and healthy little girl. I love reading your blog and I don't comment often either b/c there are usually so many comments already by the time i read it. But I love seeing how big Harper gets and how amazing your story is, every day. Hi Kelly! I have NEVER commented before, I know you are super overwelmed with comments all the time and have just chosen to sit back and pray. I am an OBU alumni and Tri Chi alumni as well. I have read your blog as long as I can remember and prayed for baby Harper as long as I can remember as well. I remember just weeping at the computer screen when I saw you hold up the sign that you were pregnant. Your blog is so uplifting and refreshing! I don't know how you keep up with it all!! I am so thankful for my adorable, healthy 5 month old (Reed) and my wonderful husband and family! Today I am especially thankful for an amazing church family at New Life Chuch (www.newlifechurch.tv). I'm thankful for my good health; my salvation; my boyfriend who's soon to be my fiance in less than 18 days; my wonderful family;and that my grandpa is improving (he's been in the Heart Hospital for 2 weeks now)! Hey there -I'm Nicki a lurker from New Zealand - not sure how I ended up at your blog but I have been reading it since Harper was born. My oldest is 14 tomorrow I also have a 12 year old and a 10 year old. I love all your monogrammed stuff! Greetings from Oregon! I am thankful for my 2 kids and hubby. Praise God! We had a wonderful 'family' day today. I am from Louisiana and wanted to say that I am so thankful for my new baby boy who is now a week old. The doctor actually told us we were having a girl, but he was wrong! I am thankful for so much and yet, I know I don't express my thanks to God nearly as much as I should. I am most thankful for my husband of almost 9 years, our 3 year old son, and for the baby that will be here in February. Thank you for your blog and for being such a great role model and example in Christ. This is my first-ever "Kelly's Korner" comment...but today, I am thankful for the little boy inside of me! He has been growing, growing, growing for 29 weeks and has changed my life in so many ways...already!! Unlike you, Kelly, I got pregnant on the first try. I feel like through that first "positive test" God was telling me that He was ready for me to be a mom, and my husband - a dad. I am very much looking forward to November 20 when he will come into our lives and continue to bless us, change us, and turn us into the parents we are supposed to be. God is so good. He has blessed me in so many ways...a loving husband, a wonderful family, an amazing pregnancy since day 1, this healthy little boy, etc... I could go on and on. I follow your blog daily and absolutely love it! I am simply thankful to be happy with a great job and family! And to live in the South! I am a true lurker! I have been reading your blog for a few months now and never commented. Because I enjoy reading your blog so much I recently started my own! Today I am thankful for my wonderful husband of over a year and our four furry 4-legged children. I love reading your blog and hope to one day be able to inspire people the way your blog does. It is so refreshing to read. Thank you for sharing your life! I am thankful for a job! I know so many people who are without jobs and can not find one. I dread Mondays because I dont want to go to work but really I am so thankful for a job. Harper is a doll! Congrats on 1000 posts! Thankful for my healthy family. Love your blog...you are an inspiration. Yes, you are! I am thankful tonight for my wonderful Christian husband and most Godly man I know, John. He is more than what i prayed for. I am also thankful for my little 2 and a half year old Dalton Cade. He is so healthy and smart and just a precious little boy! i am very thankful for my wonderful church family. Thanks Kelly for giving us this opportunity to Thank God for what he is doing in our lives! Congrats on your 1000th post! I am so thankful that my husband will be home soon after a long absence (he has been working in another state for the past year). I am thankful for so many things...some of them trivial (like the delicious chocolate chip banana bread I baked today)...but most of all, I am thankful for my family; my husband and my beautiful, four month old baby boy. I have great friends, great parents and siblings, and a job that I love. Thank you for your blog and for sharing your life with us! I've been "addicted" to your blog since Harper was born. A friend told me about it, and I've been here daily ever since! You inspire me to be stronger in my faith! Today I'm so thankful for my beautiful 3-year-old girl who teaches me more in a day than anyone else! I am thankful for my sweet baby girl. I am thankful for so much in this wonderful life I have been given. I am thankful for my hard working, loving husband and my three beautiful, healthy, smart children. I am thankful most today for my brother being released from the hospital after a bout with pneumonia and for a friend who just had a brain tumor removed and is recovering beautifully!! I am truly blessed and I don't think I could possibly express how grateful I am for all I have! I am delurking now! I love your blog and think you and Harper are precious (and Scott too :)). I love that you just keep it real! I started following your blog when Harper was in the hospital. So glad she is perfectly healthy now! I love all of her monogrammed things....as I am a lover of all things monogrammed...I even have a monogramming business. I LOVE LOVE LOVE the story you shared about her precious dress. I can't wait to follow on your journey on the Compassion Trip. That is so cool! I am thankful for my precious husband and 3 beautiful children. God is so good and we are so wonderfully blessed! Love ya Kelly! What a powerful testimony from the maker of the precious dress. Gave me goosebumps, too! I'm thankful today for sweet children (ages 3 and 5) who point me to God. Here I thought I was teaching them for THEIR benefit -- but I learn as much from them, because God uses them so mightily. I am thankful for a husband who has always been there for me and supports me in every way. Most importantly I am thankful for a God that is faithful and so good!!!! I am a FAITHFUL reader of your blog and have been since Harper was born! You have been an inspiration to me as we struggle with infertility. We have been trying for 3 1/2 years. Thank you for remembering those of us who are still in "the trenches." I am SO thankful that I have married my best friend! I have been reading your blog since I came across it when Harper was born and had complications. I started praying for her and have followed you since. I fell in love with all your posts and all the beautiful pics. My 2 year old little boy will ask who is that when I am looking at the blog and the pics. I tell him it is his future girlfriend :) I am thankful today for an amazing husband and 3 healthy beautiful children. Our God is so good. I married my best friend and have the family I always dreamed of. I go to bed a happy lady at night. I am thankful that we have had gloriously beautiful weather today AND I am especially thankful that my precious miracle baby is turning eight tomorrow! I love love love reading your blog! It reminds me of living in the south (we used to live in Nashville) and I like to think that our girls would be friends if we were "real life" friends. I am SO thankful for my two wonderful babies (Emily, 19 minths and Ethan 12 days old) and my husband, Matt. I guess I could go on and on about all of the blessings in our lives but my family is the first thing that came to mind. I feel very blessed! I am thankful for my new 5 day old beautiful grandaughter. I enjoy reading your blog. I have been reading your blog since Harper was born, and have enjoyed seeing her grow as my little boys grow. I am so thankful for having two wonderful boys that God has blessed me with that makes me smile over and over everyday. Hi from Oklahoma! I'm a lurker, and have to confess that I love reading your blog and hearing about all the monogramming you do for your beloved daughter. Ha! She's too precious! I'm very thankful for my loving husband. He puts up with me, which, sometimes, is a lot of work! I am thankful to have 3 healthy sons, a husband who loves me, and a God that sent His son to die for me! I am thankful that I can see and know how to read. I am thankful I can read blogs from people I have never met, but feel God's undying love pour out of them. I am thankful for my healthy five month old daughter and my wonderful husband. I have been reading your blog since before Harper was born but never really comment! Thanks for sharing your life and inspiring us all! I posted early but forgot to say what I am thankful for! I'm thankful for my wonderful husband and children. I am thankful for so many things, but especially my wonderful, sweet husband. He is an amazing man! I read your blog often and think your daughter is adorable. I am uplifted by many of your posts. Hello, Kelly! I'm another lurker who never comments! My husband and I have been struggling through infertility for over a year, and it's always such a blessing to read your blog about your gorgeous daughter! Also, I went to Henderson across the street from OBU, so I love hearing all your OBU and Arkansas stories! Kelly, I read your blog pretty much every day. You make me laugh and cry and inspire me. I started reading a little before you got pregnant with Harper and I have enjoyed reading your story. I am thankful for this wonderful fall weather we are having in West Texas and for our little girl that will be born in December! Hope you have a Wonderful Week! Thankful for the Love and Grace of God and the blessing of my 3 beautiful, healthy children! I am so thankful that I got to be a part of 17 baptisms at church today! I gave gifts from our women's ministry to every woman baptized and it was amazing! Thankful that my 5 year old baby girl asked Jesus into her heart today. She told me that she wanted to get "babatized"
Kelly I have been a lurker on your blog since January. I saw the Prayer Request on someones blog for Harper. I started reading your blog and praying for Harper and your family.Your faith has inspire me so much. I am a better person from reading your blog everyday. I look forward to it.Thank you so much. Please dont ever go private. I also have tried several of your recipes. And Harper is just precious!! Pray for me I am having a rought time at my job. Also my daugher had a miscarriage in May. Congrats on your 1000th post! Harper is just adorable. I love her sweet, smiling face! I am thankful for my precious 10 month old little boy! I am from Texas. I am thankful for my sweet baby girl, Bayley, who was born 1/20/09 just a few days after Harper. I am so thankful for my all my family and friends. Love reading your blog and all the blessing you have brought me :-)!! you know i read every day. harper is gaining on tess! tess is almost crawling but not quite there. I have been a reader for a couple of months, and love reading! I love your positive spirit and love for our Lord. I am thankful for my two boys' health. It is so easy to take for granted.